The High Technology Foundation’s Optics and Photonics team is working to develop technologies that will allow the nation’s military, law enforcement, and private security communities to detect and identify potentially hostile people at long distances, under lighting conditions ranging from bright sunlight to total darkness. 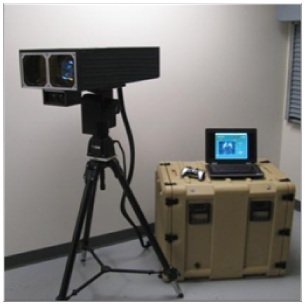 The technology, known as “active SWIR imaging”, combines a short-wave infrared (SWIR) illuminator with a telescopic zoom SWIR camera. The illuminator projects an invisible, eye-safe beam of SWIR light onto the target, while the camera zooms in for a high-resolution facial image. Computer face recognition software, optimized to match SWIR facial images against a visible database, can then identify the individual. The technologies currently being developed by the High Technology Foundation will be able to identify individuals at distances of several hundred meters, even in total darkness.